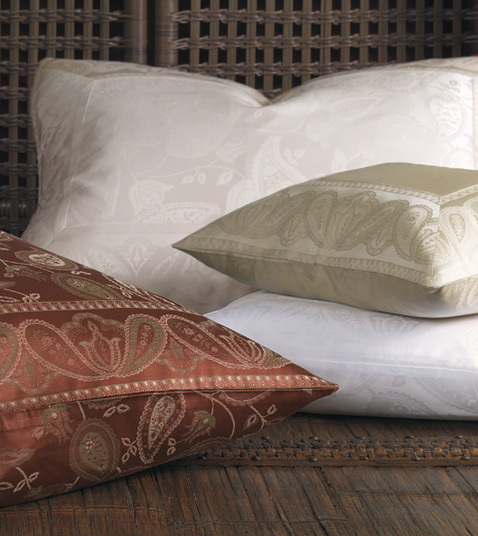 HENNA by De Medici - classic paisley jacquard bedding design. Opulent and silky, HENNA is woven in Italy of 600 TC and is available on this page in white, ecru and sable. Combine HENNA sheets with De Medici Coperta quilted coverlet and shams. Henna Twin Flat Sheet 75"x110"
Henna Queen Flat Sheet 96"x115"
Henna King Flat Sheet 115"x115"
Henna Twin Fitted Sheet 39"x75"x17"
Henna Queen Fitted Sheet 60"x80"x17"
Henna King Fitted Sheet 78"x80"x17" or Cal King Fitted 72"x84"x17"
Henna Twin Duvet Cover 63"x88"
Henna Queen Duvet Cover 88"x90"
Henna King Duvet Cover 102"x90"